E-Z C350 image drum reset kit. Works for C350 C351 C450 Imaging IU-310C Konica Minolta Bizhub for North American printers. With our 4 step kit below you will be able to reset your own drum counters for pennies on the dollar. Just slide the drum chip into the re-setter coupling connection. Choose the appropriate color reset (cyan, yellow, magenta, or black) on the piano style dip switch (see settings below). Slide the switch and wait until the green LED light is turned on. You now have reset your counter to new condition, its that easy. How to Use Your Drum Reset Chip Tool. Slide on your used Minolta Color Drum Chip (Cyan, Magenta, Yellow) or the Minolta Black Chip but do not do both simultaneously. Toggle the correct DIP Switch Setting for the type of Chip to reset (see table below). Flip on the reset switch. Wait for green light to come on. Release the reset switch, and you've now reset your Drum Chip for that color. Repeat Steps 1 through 3 for other 3 color chips. Its not necessary to match color of cyan, yellow, or magenta chips to previous usage as they can all be converted to one another by the dip switch, only black chip is physically different. When your done with resetting all your chips, store your "Infinite Minolta Drum Re-setter" for next time. Finally, install your recharged chips. The infinite re-setter kit utilizes (3) 11.6mm AG10 equivalent watch batteries (batteries included) which will last for years without replacement, but these batteries can be bought 8 in a pack from your dollar store for just a dollar. So maintenance of this kit is indefinite and cheap. How long does it take to reset with the kit after the switch is turned on? About 3 seconds the green LED light indicates a successful programming. If this does not occur than the root cause is most probably poor contact to the chip re-setter. What happens if the reset switch is left on and do I have to turn it back off after utilization? This can't happen as the reset switch is a spring loaded momentary switch, once you let go of the switch slider it will deflect to initial off condition. Saving the battery for future use. Thank you and have a nice day. 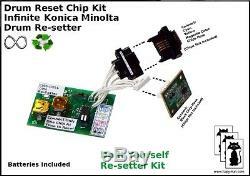 The item "KONICA MINOLTA Infinite Reset C450 8022 IU310C IU310Y IU310M IU310K" is in sale since Sunday, June 24, 2012. This item is in the category "Business & Industrial\Printing & Graphic Arts\Printing & Graphic Essentials\General Accessories". The seller is "kopy-kat*com" and is located in Mesa, Arizona. This item can be shipped to North, South, or Latin America, all countries in Europe, Japan, Australia.